The NMTrypI concept is based on the development of innovative drug leads including a mechanism- based combination of a known and investigational drug and dual targets inhibition by using a common drug discovery platform. The platform is established by experts in their respective fields from SMEs and the public research sector in Europe and in disease-endemic countries. The innovative concept is reinforced by the identification of preclinical biomarkers enabling the proteomic profiling of the compound to understand the mechanism of action (MoA biomarker) and to detect the efficacy of the lead candidate (pharmacodynamic biomarkers). The new NMTrypI platform will perform the screening of compound libraries, lead development, testing in mice, hamsters and dogs as a reservoir of the visceral leishmaniasis disease as well as toxicology and safety testing (in vitro against cellular types and in vivo in animals) to overcome current limitations in anti-trypanosomatid therapy. early phase biomarkers for efficacy prediction (overall improved efficacy and safety). 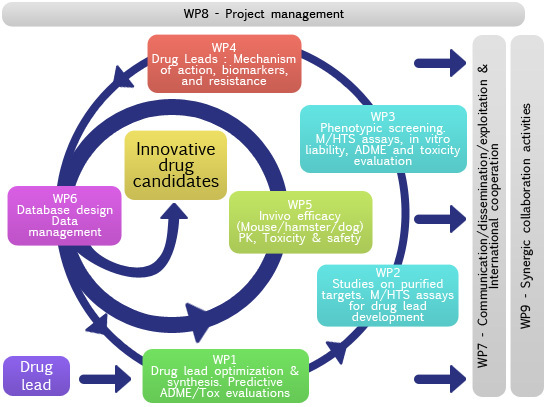 NMTrypI will translate drug leads into drug candidacy through 6 scientific work packages (WPs 1-6) supported by 3 transversal work packages (WPs 7-9) dedicated to project dissemination and management, and synergies with other similar projects. The application of the new NMTrypI approach is expected to lead to an adapted and affordable treatment of Trypanosomatid Infections in disease endemic countries. The NMTrypI project may contribute to a major breakthrough towards finding a real therapy for NTDs. Carrying out the project at international level with the inclusion of EU and disease-endemic countries in the consortium provide unique blend of experts to work in the field of trypanosomatidae which would further increase the versatility of the projects outcome. The four intensive research SMEs involved in the project aim at exploiting the results generated in order to generate more revenues for the companies and therefore develop their competitiveness allowing them to gain new markers, to further develop their research and also to create more jobs. Global international cooperation: NMTrypI consortium will further develop partnership/collaboration with international initiatives, existing research consortia or programs on NTDs - in particular the Geneva-based Drugs for Neglected diseases initiative (DNDi) and the US-based Consortium for Parasitic Drug Development and Institute for One World Health (IoWH). These organizations proved formats to enable progression of compounds through clinical trials thus filling a gap created by the abandonment of these areas by the pharmaceutical industry. This cooperation will allow joining forces, avoiding duplication and speeding up development in an international cooperation context. Increase of European competitiveness: NMTrypI results will contribute to the development of new scientific knowledge needed for the development of new drugs: therefore, the competitiveness of European pharmaceutical industries could be further reinforced, especially the SMEs participating in the project. Socio-economic impact: the final goal of the project is a step forward in the development of new therapeutic principles for anti-trypanosomal treatment that will directly lead to a benefit for human health. The exploitation of discoveries (target specific inhibitor/compounds) will directly lead to an improvement of the quality of life in developing countries as well as in Europe. The aim of the NMTrypI project is the discovery of potentially useful drugs for trypanosomatid diseases affecting humans and dogs for which no satisfactory treatment exists. Research project involves the use of experimental animals, namely mice, hamsters and dogs. Experimental approach involves the use of in vitro primary screening with the aim of reducing the need of animal experimentation or at least reduces the numbers of animals needed. However, selection of hits and leads by in vitro selection does not preclude the employment of limited numbers of animals as the final step of evaluation of the new treatments. Nonetheless, selection model employed has drastically reduced the need of experimental animals. Legislation for the protection of animals used for scientific purpose. Council Directive of 24 November 1986 on the approximation of laws, regulation and administrative provisions of the Member States regarding the protection of animals used for experimental and other scientific purposes (86/609/ECC), modified by Directive 2003/65/EC of the European Parliament and of the Council of 22 July 2003. Reduction refers to methods that enable researchers to obtain comparable levels of information from fewer animals or to obtain more information from the same number of animals. The Consortium considers the aims in all work packages ethically justified as the experiments will be carried out under ethical conditions, and the NMTrypI consortium will guarantee the compliance of all procedures with relevant European and national legislation by each Partner involved. The Scientific Advisory Board (SAB) assists and facilitates the decisions made by the Steering Committee and provides scientific advises to the project. The Intellectual Property (IP) Committee is composed of one IP expert from UNIMORE (M. P. Costi), one from SME (A. Venturelli, TYDOCK) and one from academic (T. Calogeropoulou, NHRF). contribute in defining the most appropriate strategy to protect IP generated by the project. WP1: Lead optimization & synthesis. Predictive ADME-Tox evaluation. i) Synthetic folate pathway-targeting pteridines, benzothiazole and thiadiazole derivatives. Synthesis of known and designed compound libraries filtered for ADME-Tox in silico (3-4 libraries for each compound class). Lead Compounds from natural product libraries. 1-2 drug candidates of synthetic and/or natural origin. WP2: Studies on purified targets. M/HTS assays for Lead development. WP2 integrates the screening of compound libraries. The target proteins will be obtained and inhibitor- target interaction studies will be performed using biophysical methods (x-ray crystallography, fluorescence spectroscopy, isothermal titration calorimetry). The optimized leads will be identified through HTS target testing and combinations prioritized according to cellular liability assays results. In vitro toxicity, ADME and safety (in WP3) are prepared for delivery in animals (WP5). Production of purified trypanosomal proteins. Identification of compounds for further study, 1-2 per class/parasite. WP3: Phenotypic screening. M/HTS assays, ADME-Tox evaluation. WP3 concerns the development of functional screening through cellular testing. Natural compound mixtures are tested first on sensitive parasites and then the optimal mixture tested against relevant drug resistant strains. Only the selected mixtures from the dereplication process will be purified, and compound isolated and characterized. Final ranking and selection of the leads identified with related molecular and biological properties will be provided based on TDLP criteria. Development of functional screening parasite testing. Development of compatible assays for targets, their use in screening against natural products. Ranking of compounds for further progression based on activities of compound properties to include suitable secondary assays and in vitro ADME-Tox data. WP4: Drug leads: mechanism of action, biomarkers, and resistance. The aims of WP4 is to identify the mechanism of action and off-target effects for improving the design of optimized leads and to identify in vitro potential drug resistance that may evolve from the delivery of the leads to the parasites. Optimized drug leads designed on the basis of the off-targets are identified to be fed back to lead optimization in WP1. Combinations of PTR1 and DHFR inhibitors will be studied independently and then together, following the appropriate protocols. Biomarkers (protein profile) through proteomic approach of drug lead action on parasites will be obtained. The evaluation of the efficacy of drug candidates in T. cruzi, T. brucei, L. major, L. infantum, L. donovani infections in animals to be performed in WP5. Drug target and off-target identification in drugs lead treated parasites. Mechanistic target and resistance information for feedback to lead optimization in WP1. WP5: Animal models of candidate drug evaluation. PK, toxicity and safety studies. WP5 aims at determining the efficacy of non-toxic and safe selected leads (WP2) against laboratory models of trypanosomatid infection (Trypanosoma spp, Leishmania spp). Secondly, WP5 aims at evaluating the in vivo toxicity, safety, PK and PD parameters' of selected drugs in different organs from the mice & hamsters models. Thirdly, WP5 aims at testing specificity and leishmanicidal activity in dog models for the most promising candidate drugs. Validation of trypanocidal activity, complete evaluation of pharmacokinetic properties, toxicity profile, safety and pharmacology. Pharmacokinetic profile obtained for 1-2 compounds/class. 1-2 compounds tested on Leishmania infected dogs. WP6: Database design and data management. 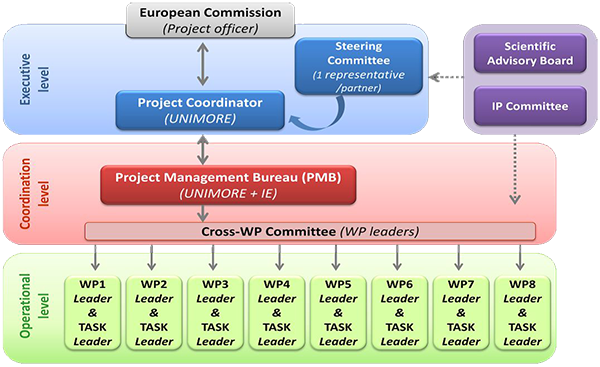 The main objective of WP6 is to provide comprehensive data management for the project, i.e. a place to collect, structure and share data: experimental data, models, standard operating procedures (SOPs), as well as a participant directory (yellow pages). Database system to collect and share all the project data. Software to store, manage, search and query all information. WP7: Communication/Dissemination/Exploitation & International cooperation. To define the communication strategy and tools. To actively pursue an exploitation and dissemination strategy for generated knowledge. To ensure cooperation with Brazilian and Sudanese partners and with international initiative on NTD. To set up an exploitation plan in order to maximize the value of exploitable outcomes. Set-up of NMTrypI Collaborative platform and Project Public Website to assure Consortium internal and external communication. NMTrypI Communication and dissemination plan and Exploitation plan.